Battleground - "Did You Win?" The pilot of Battleground is its own—forgive me—battleground, its scrappy underdog charm fighting tooth and nail against its stylistic excesses. The structure jumps through time instead of just telling a compelling story, and the show’s sense of humor endorses anything for a laugh. But without the dweeby intern speaking in Renaissance festival language, the episode wouldn’t be as fun. Both elements suggest a fundamental lack of focus that could doom Hulu’s first original program. Twelve weeks later, Battleground uses the mockumentary format better than anything since Tim turns his mike off on the original incarnation of The Office. The talking heads from the future where Ben and Lindsey are married and Cole is in a prison uniform remain bad dates, all amateur portent and emphatic nostalgia with pauses you could drive a campaign bus through, but they’re relied on less as the season goes on. Ignoring those, what makes the format so impressive is its commitment to a premise that shows with much larger budgets and writing staffs can’t be bothered to adhere to. The audience is watching a documentary about the staff of Tak Davis, first on the Deirdre Samuels campaign for US Senate from Wisconsin and now, hopefully, for the presidential campaign of Senator Donnellan. And creator J.D. Walsh, who directs and at least co-writes every episode, turns Battleground into a brilliant interrogation of the format by exploring the relationship between the watchers and the watched. Since the audience is ostensibly watching the finished product from some indeterminate time in the future, the camera crew don’t show up on-screen unless they can’t be cut. It’s easy to forget there even is a camera crew watching the main characters, but then, every time the fourth wall breaks, it’s a thrill. Seeing Cole take a smoke break with the documentary guys suddenly suggests this whole off-screen narrative of these relationships forming that’s momentarily disorienting and then beautifully logical. And then the audience discovers that they’re only seeing this scene because it impacts the narrative, since Cole only found out that Tak kissed K.J. because he accidentally saw the footage. Later Ben uses the cameras as leverage with a cop potentially violating their rights. In the finale, “Did You Win?” the camera crew has to race alongside the staff to make it to a rally, so the camera spends some time pointed at the ground. The scarcity of these incidents, which occur just five or six times throughout the season, gives them each power. The variations among them, each reflecting some unique perspective on the format, paint a fuller picture. And the honesty of the accidents, the hazards of documentary filmmaking, establishes this reality better than anything else. For at least one component of Battleground, everything is motivated. How’s that for a lack of focus? 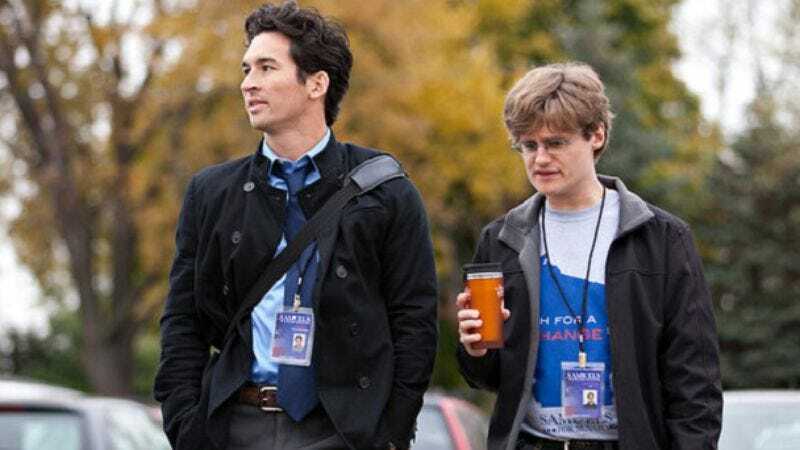 The flash-forwards are so artificial it almost feels deliberate next to the hyperverisimilitude of the documentary stuff, the newscasts, and “Flashback,” the episode about Tak and his father on the 2004 Makers campaign presented as an episode of an MTV True Life-type show that’s both perfectly timed in the campaign narrative and nauseatingly immaculate in its parody. It’s clear Walsh knows how to ground events. In “Did You Win?” he sells a visit from President Obama to a Samuels rally with nothing but a backstage monitor playing an old Obama speech and the audio playing as Tak’s crew silently look off-screen toward the stage. Around that time, KJ talking-heads,“We knew from our internal numbers that we were up. The only way Creighton had a chance of winning was to cheat.” According to an early title card in “Did You Win?” Makers and Creighton are tied at 42% of the vote going into Election Day, but whatever. Creighton does cheat, busing in Illinois voters thanks to a loophole in Wisconsin’s voting laws, and it pays off. Samuels loses, Tak now has seven failed campaigns under his belt, and I, for one, was shocked, and not just because Donnellan calls to ask a campaign manager who has never won to run his presidential bid. There isn’t one moment when everyone realizes they lost. Everyone gets there on their own, which creates a palpable angst. Shortly thereafter, everyone’s quietly celebrating the Donnellan call when Samuels walks in, mistaking their fortune for hers, one last gut-punch thankfully delivered off-screen. Toward the end are two speeches that illustrate those same opposing forces that animated the pilot. From the evil Tak-less future, Ben talks about the chaos of the campaign. But Battleground never feels chaotic from a narrative perspective. Except for the very occasional plot point, like Rudy’s text messages and Cole’s resignation, plots are resolved by the end of each episode. The cast are sorted into A- and B- and C-plots, and no problem approaches the apocalyptic gravity of the bankruptcy in the pilot. The show is basically lightweight, focused more on the surface narrative than any motivating thematic purposes. And Tak is so good at his job that no obstacle comes close to feeling insurmountable, though the affair is a nice start. If the campaign is meant to feel chaotic, maybe Tak should have it out with the director again. Good timing, Hulu! Yesterday wasn’t my favorite Election Day, but Battleground makes for good comfort food. And tomorrow is Election Day in Pawnee! We still have no idea how Cole winds up in jail and what Ben has been slipping Lindsey to make her fall for him and sit there meekly at his side in the future. Which is fine by me. I’m so relieved Samuels had an affair and transferred a co-worker to silence her. All these honest politicians on TV are exhausting. The only cast member who never really shines for me is Ben Werner. But they can’t all be Ray Wise, whose menacing charm blew my laptop apart on every appearance. Dude would eat Eli Gold for breakfast. Another great use of the camera crew: The DNC coordinator who tattles on Cole—surely the Secret Service would be on that, already, but still—isn’t just living up to her own moral code. She’s on camera hearing that information. Which makes it a lot easier to accept Cole taking her back. The closing tag, with Ali playing the circle game with the cameraman, justifies a second season on its own.